In the Toolbox fill it with the gradient (>). Now bring up the Gradient palette. The pop up window shows the gradient in your rectangle. Underneath it are two little squares indicating the two colours which make up the gradient. Double click on one of them. A dialogue box pops up which allows you to change this colour. 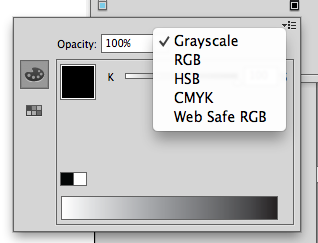 If your gradient is black and white you may need to change the colour from greyscale to CMYK. Do this by clicking on the Flyout Menu at the top right of the pop up box. When you have the colur you desire, hit Enter. Now change the other coloured square.